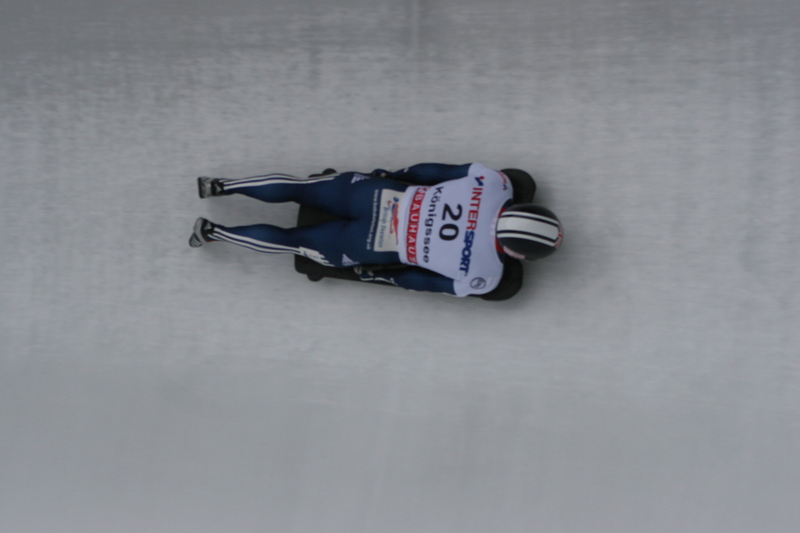 Here’s a video of Shelley Rudman crashing during training in Konigssee last week. This is basically what happened to me in my previous 3 races on that track! I had some demons to exorcise on my trip to Konigssee in Germany. My last 3 races on this track have resulted in me crashing quite dramatically and finishing at the back of the field. 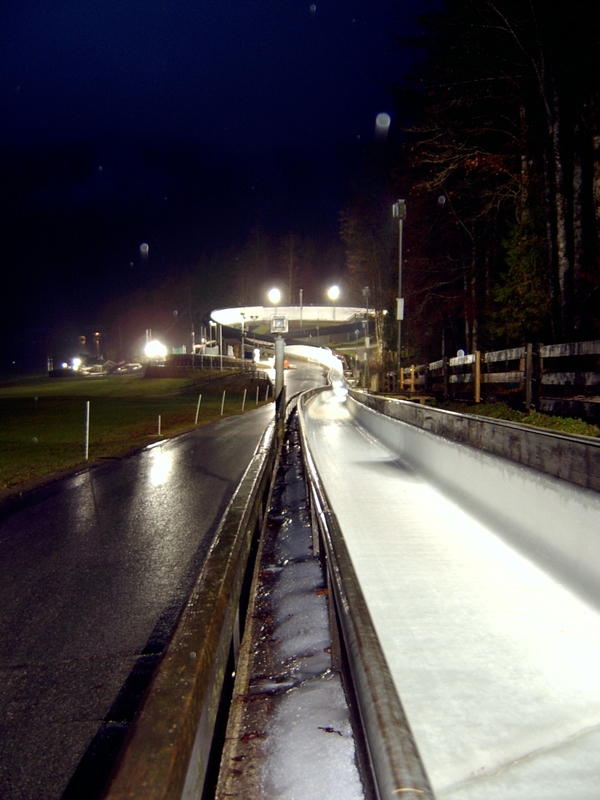 All 3 crashes were due to 1 particular corner on this track – the kreisel. On my previous visits here, I didn’t really have a problem with this corner in training, but the combination of a spritzed track and polished runners meant I didn’t have enough grip on the 3 race days and having not controlled the waves enough in the kreisel, I would find myself exiting the corner at a bad angle, heading towards one of the side walls and flipping over onto my back. I didn’t want to make it 4 in a row, especially with my Dad coming out to watch and the fact that it was on Tv too! I woke up on race day and all I could think about was whether I was going to crash or not! My heart was racing before I realised this wasn’t good psychological preparation at all. I decided to take race day as if it was just another training day, but with a fast push at the start. Concentrating on the key areas on the track and going through my visualisation techniques, rather than the thinking about external expectations, my outcome concerns or the pressures of competing on World Cup. With my history on this track, some sled problems hampering the training days before the race and my foot issue, I would have taken 15th at the start of the day. This result was made better the next day when it was discovered that my sled was bent in 5 different places. I’m sure this was the cause of some problems in training and it would have had an effect on my times in the race, but how much, we’ll never know. It’s all been straightened up now so I’m looking forward to racing in Switzerland this Friday on a square sled! Having missed most of the Christmas break last season due to a GB race off for World Cup positions, it was great to be home for a longer period this time round. I received the news that I was staying on the World Cup circuit for the 2nd half of the season, which means I’m competing in the last 3 races in Konigssee (Germany), St. Moritz (Switzerland) and Igls (Austria). I’m now in Konigssee, first day of training starts tomorrow with the race on Friday 8th January. 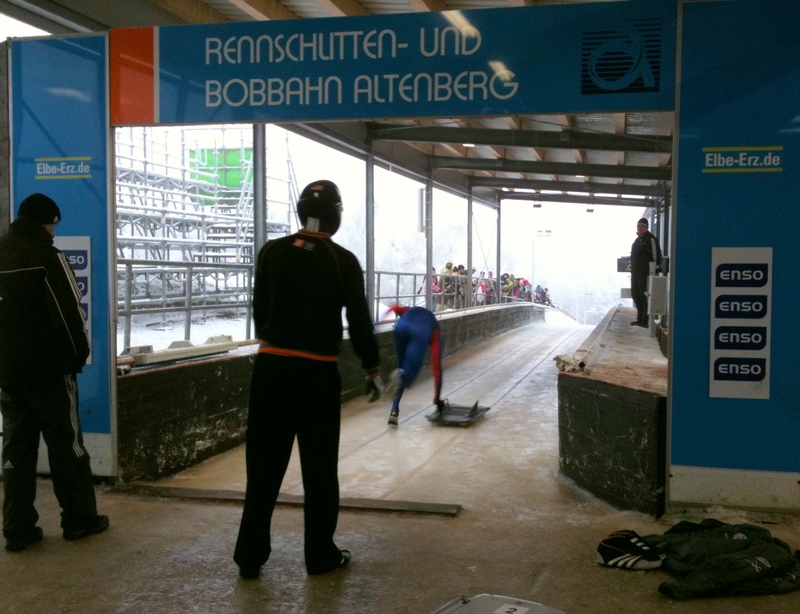 A cold snap was on its way in Altenberg and I wasn’t ready for it. I’d gone back to my Bromley sled in Winterberg but there wasn’t enough time to get all of my sets of runners converted from one sled to the other. No-one had predicted that race day in Altenberg would bring air temperatures of -17*C, but most other athletes would have runners in their possession to cope with such cold ice. My ‘cold’ runners for these conditions were not converted in time for this race. If you can imagine asking Lewis Hamilton to drive with slick tyres when it’s heavily raining, you’d get the idea of how much grip I had during the race! I did the best I could by adjusting the amount of bow in the runners but it wasn’t enough. A few skids here and there did the damage and left me at the back of the field and without a second run in 27th position. Next stop on the World Cup tour is Altenberg, about 5 hours drive east of Winterberg and still in Germany. It’s cold. The Altenberg track is probably the most technical in the world, which makes it tricky as I haven’t been here for 3 years! The first 2 days were challenging, the timing of my steers were off and my lines down the track were not very pleasing on the eye! It was to be expected. I’m still having trouble with the kreisel, which is the name for a loop in the track, although I’ve managed to fix quite a lot of other problems. The start area here is also unique as it’s long and flat, meaning we have to run a lot further than we normally do. This, coupled with the high pressures in a lot of the corners and the concentration needed makes it a tough week on the ice! I think the Christmas break after this race will be well deserved. Yesterday we had a group of kids come and watch from one of the local schools. As you can see in the picture, they were at the start at one point, cheering us all on! We also had a BBC film crew out with us to get some footage and interview us individually for Ski Sunday. I think it’s showing on the 27th Dec, but I’ll confirm at a later point. Today it was the coldest day so far at -8*C but it’s due to drop further over the coming days. It’s the last day of training tomorrow, with the mens race on Friday morning and the women’s race Friday lunchtime. I’m a full time athlete and I’ve been competing for Great Britain in skeleton bobsleigh since 2004. I’m aiming to compete at the 2010 Vancouver Olympic Winter Games. You can click on the interactive map below to follow me around the world, or you can browse through old blog entries, check out skeleton related websites, view pictures and video or leave comments below. PETER WOOD on Airport Mayhem!